Mobile devices are becoming more and more a part of everyday lives; they have been increasingly used for shopping, working, and communication. The past years have seen massive growth in games and entertainment, 2014 was the year apps got down to serious business. 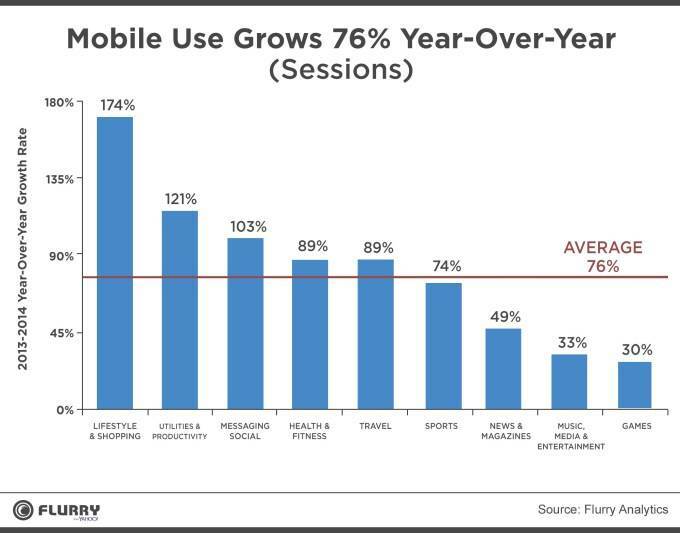 Flurry Analytics reported that mobile app usage grew by 76 percent in 2014, led by Shopping, Utilities & Productivity, and Messaging apps. Messaging has triple-digit growth in the past year, and contributed greatly to the overall increased usage of apps. Sessions in shopping apps on iOS and Android has increased by a whopping 174% year-over-year the biggest growth being on Android, where the shopping category increased by 220%.Utilities & Productivity apps were also popular in 2014.Games sessions continued to grow in 2014 though compared to 2013, it slowed down from 61% in 2013 to 30% in 2014. Notably, growth in the Games category continues, but has slowed, along with slowing growth in Music, Media, and Entertainment categories. Shopping apps and user behavior and found that users shop on their smartphones while out and about during the day, with Shopping app use spiking during the commute time of 9 AM and at noon (likely, lunchtime). Shopping also spikes again during “prime time” at 8 PM, making it something of a leisure activity that takes place as users unwind after work and dinner. Growth in App usage calls for more innovative app development and it’s a challenge to the developers. The Pocket App team has extensive experience working with Agencies, Corporates, Brands, and Mobile Operators across the globe and the expertise across the whole mobile ecosystem to provide solutions for various apps.